If you have been following my blog, you probably get the sense that I am an overall positive person who has overcome some pretty great adversity. But life hasn’t always been so grand and happy for me. During my first semester back to law school in 2009, I struggled emotionally and lived in fear of the unknown. Upon arriving back in Rhode Island, my friends offered their support and assistance with anything that I needed. But what nobody could offer me during these times was the guidance and calming effect that was provided by my doctors, therapists and family. I took a full course load, which in retrospect I probably should not have done, but I needed to prove to myself that all would be fine and live my usual life and resume my schedule. What I neglected to realize was that I couldn’t just jump back in – things needed to be readjusted and put into perspective all over again. Classes proved difficult. I had trouble managing my time as the readings took a lot longer than they had previously; reading through the legal jargon just to understand the judge’s reasoning behind his/her decision took hours. I struggled with taking notes about what I had read. This became a major problem, as my final exam grade was contingent on what I could absorb and comprehend from these readings. I struggled and wanted to just quit at times. Nonetheless, I put a smile on my face and carried on. What nobody knew is what a dark and difficult time this was for me. Even though I was so happy to be back in school working toward earning my degree, I was struggling and was spending more hours in my professors’ office hours each day to go over the materials instead of living the everyday 24 year-old life I was used to. Was the neuropsychological testing correct – were my cognitive impairments permanent? Was I going to fail out of law school? As the semester came to a close, I panicked because finals were approaching and in law school, final grades are based upon one grade – your score on the final exam. In addition to this stress, my personality was changing. I was suddenly guarded about who I was as a person and as a law student and became insecure about my knowledge and skills. When in class, I listened to my peers recite the case with ease and making it look like a walk in the park. I grew irritable and frustrated with my abilities (or should I say, inabilities). There were many moments of loneliness and a feeling of helplessness. Then, there were moments of emptiness. After a night out at a bar with my friends, we all returned to Ashley’s so the night would continue but I noticed that my friends were happy, loving life and seemingly without a worry in the world. As I sat there watching, I began to reflect on what had happened to me and what I had been through six months prior. The magnitude of emotions got to me and I went to an upstairs room, sat on the bed reflected and let my emotions pour out. Fortunately, Ashley, being my rock and support system, immediately noticed and rushed upstairs behind me. She did not say anything, nor did she need to. She tried to be strong for me and to keep me encouraged but little did she know, I saw a tear rolling down her cheek. My story has had so many ups and downs that are full of laughter, sorrow, inspiration and hope. But I have never, until just recently, expressed the emotional toll it took. I don’t know why, but recently I’ve felt the urge to share, in particular because I have been hearing of more and more people undergoing a hardship. Dealing with a brain tumor, or any illness or disease for that matter is scary and your life gets turned upside down and nobody should have to face it alone. So while I have shared a lot about the positives of my story, there have also been a lot of emotional times as well and for those of you who are undergoing something similar, you know what I mean. In the past week, I’ve done some thinking. Okay, that’s a lie – I’ve done a lot of thinking. Mostly about that bright spot on my MRI and what it could possibly mean. Is it tumor activity or is it radiation necrosis? Only time will tell so until December, I must let it go and move forward with my life. And as I move forward and try to put my ordeal in my past, I have become involved with the Connecticut Brain Tumor Alliance (CTBTA). As you saw in my last post (The Path of Hope), I am now a part of the CTBTA. This past year, I reached out to the organization because I wanted to help, wanted to share my story and do what I can to better the lives of those who are suffering today. A brain tumor can be debilitating but nobody should have to suffer through the ups and downs alone. What’s more is that with the collective efforts of enough people passionate for this cause, together we join forces to raise awareness and to find the cure. Sure, I went to law school and earned my law degree. But my battle with my brain tumor has left me unable to pass the bar exam and for reasons that I previously discussed and now dealing with the bright spot in my brain, I would not even contemplate trying again. More importantly though, working within the brain tumor community to provide support and provide fundraising efforts to finding the cure is my passion. As a result, the sting of defeat four years after graduating and still being unable to practice law has been tamed and honestly, I am okay with how my cards have been dealt. I am constantly being told that I am always smiling, always pleasant. Even on those days where everything goes wrong and I just want to scream, I take a step back and reflect on how fortunate I am. When you go through a life event such as what I went through, or any person with a life-threatening illness for that matter goes through, you realize how great life truly is. For me, I realized this years ago and finally chose the CTBTA as the organization that I would involve myself with to share my life experiences and enjoy the same semblance of happiness with fellow brain tumor survivors. Not only did the diagnosis scare me. It also made me more aware of life and how we should live. It made me smarter. It made me brighter. Literally and physically. 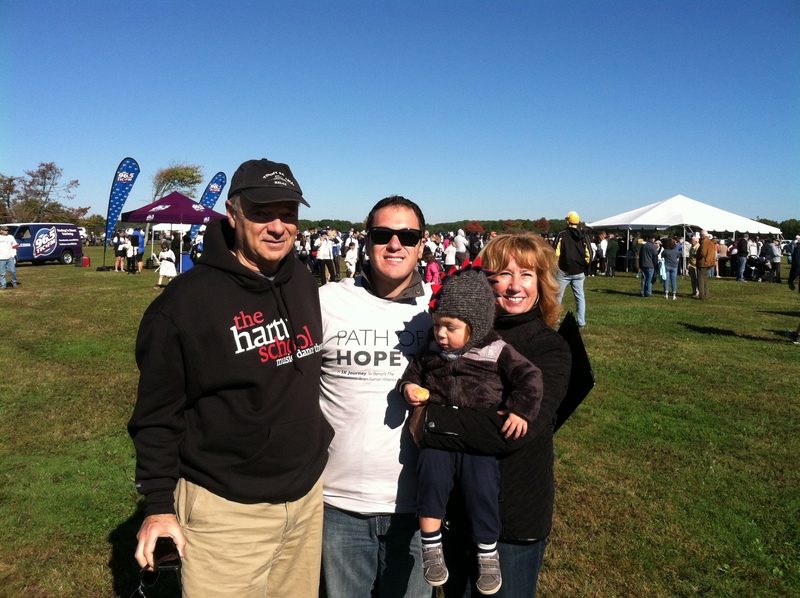 Today was the “1st Annual Path of Hope: A 5K Journey To Benefit The Connecticut Brain Tumor Alliance” at Hammonasset State Park. Despite my MRI results this past Friday, the sun was shining, the air was brisk and the atmosphere was great and it was a reason to celebrate. I felt so fortunate to be surrounded by my family, friends (both old and new) and to talk with other brain tumor survivors, patients and caregivers on this day. When I see families like mine and hear of stories similar to what I went through, it gives me a sense of knowing that our everyday problems that we complain about are not so significant. It was a great day and I am happy that I got involved with such a great organization. I served on the Walk Committee and was asked to say a few words and offered the opportunity to play my song, if I wanted to. I was honored and humbled by this offer and was very happy to share my story with others to serve as inspiration and hope for those undergoing this terrible diagnosis. Fortunately, Ashley captured the moment on video and I am sharing it here. Ironically however, my song was “interrupted” yet again. Enjoy! So the first Friday in October came and went – yes, results day. Before I get to my results, I would like to congratulate all those who passed the Connecticut bar exam. Enjoy this time and your day being sworn-in as a member of the bar! As for me? The day did not go as I would have scripted it to. I was supposed to be rejoicing and celebrating with you. Yet, for reasons unknown at this point in time, my fight shall continue on. Quite simply, yesterday’s results were inconclusive. In comparison to my scans taken in March, what appeared on yesterday’s MRI was noted as something to watch. Last December, when I went in for the gamma knife surgery, the area where treatment was being applied was clearly visible and clearly tumor. The growth was blasted with a high dose of radiation and at my follow-up MRI this past March, my surgeon gave me a thumbs up; all signs pointed to the conclusion that the procedure had killed off the tumor cells and any remaining cells would soon wither away. Yesterday, I had the chance to see for myself the three images – the MRI from last December, the MRI from March and then the MRI from yesterday. He placed all three of them on the screen for us to see. March compared to December was significantly smaller and indicative that the treatment was working. The scans from yesterday showed that the treatment site was still the same size as in March – but with one notable difference. Brightness. 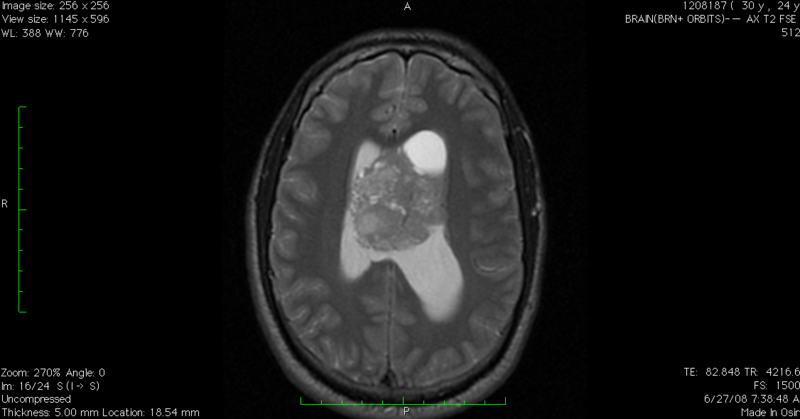 Brightness on an MRI is indicative of tumor activity. But brightness can also indicate “radiation necrosis”. Radiation necrosis is an accumulation of dead tissue and dead cells killed off by the radiation. My medical team was going to review the results with the radiologist for his opinion. Aside from that however, I’ll continue to monitor myself for headaches, dizziness, forgetfulness, eyesight problems, vomiting and nausea. Yet, because of the location of where the tumor originally was, I do not experience any of these symptoms nor have I ever until the very last-minute in 2008 at which time the tumor was likely 3-6 years old. So where do I go from here? I’ll wait some more. I am being rescanned in December and we’ll again review those results and develop a plan if needed. If it is radiation necrosis, there would be nothing that I need to do. However, if results indicate that this is tumor activity, further treatment and even surgery could be an option. This is the story of my life it seems. But I am resilient and a fighter. I have never complained or felt sorry for myself and have always maintained a smile on my face through it all and I will continue to do so. For the next two months, I will do my best to not obsess over this, but being human, that is easier said than done. However, thanks to great family and my medical staff, I’m in good hands and will once again come out on top. Maybe I’ll even have my own swearing-in ceremony as a member of a survivor/relentless fighter association! I had trouble falling asleep last night because I was thinking. Yes, thinking about tomorrow’s test and results and thus I have decided to write about it. For some, tomorrow is just another ordinary day. Maybe you’re going to work or to school. Maybe you’re going for a job interview. If you are, I understand the anxiety that you are feeling – I’m anxious for tomorrow too. As I previously mentioned, three times since 2009, twice on the first Friday in October and once on the first Friday in May, I have experienced great angst. To the hopeful bar applicants, tomorrow, I will similarly face angst with you. As I discussed in past entries, I tried and tried and tried to pass the bar exam, all to no avail. Bar exam results day has been the lowest point of my three times already. If you took the exam, you’re likely wracking your brain to remember what you wrote on the essays or whether you correctly answered any of the MBE questions. It’s an anxious feeling. With this test, there are so many things depending upon the results and you have to wait three months for the results. You will undoubtedly refresh the website multiple times eagerly awaiting to see that the results have been posted. When you look, your heart will fall into your stomach and you can only hope that you see your name on the list. Well, applicants, you’re not alone. You see, tomorrow I will go in for a test and receive my results. Right there and then. However, for once, I’m boasting. Unlike the myriad of emotions that bar applicants are likely currently experiencing, I am extremely confident that I will get good news at tomorrow’s six-month MRI. An image of my brain taken June 27, 2008. The tumor filled the ventricular system and displaced the septum pellucidum, extended back toward the body of the lateral ventricle and was hemorrhagic. Eager; nervous; excited; anxious. Those four words best describe how I feel. I’m sure you do too. I am confident that tomorrow, we will quickly forget that we feel this way. Until then, we can only wait though. I look forward to seeing social media blow up with your exciting news. I’ll be on social media tomorrow with my results, even if they are not what I hope for. There is only one difference between you and me tomorrow. If you pass, you will forever be done with tests. Me? I’ll be ecstatic, but it is still the early stages of lifelong test anxiety.